The ‘chippy night’, or more accurately ‘wedgie night’ (ouch!) has become a best kept secret (not any more) at my friend Trevor’s in Bayswater, Perth. I attended my last one recently, before I head off on my Long and Winding Road Tour that will take me across the country and across the planet. Trevor is serious about his wedge-making. 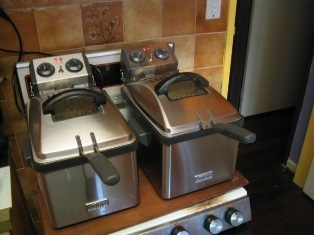 Two industrial strength fryers adorn his stove top, poised to receive the potato motherload. 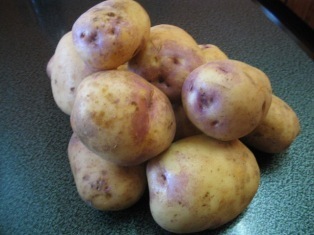 Only the best spuds are selected. These are the old Scottish pink-eyed Kestrels, purportedly Western Australia’s best chip-making spud. The crispy, crunchy skins adorn the warm melty interior. 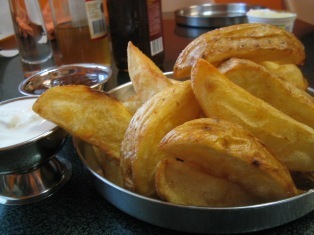 Served with sour cream and chutney, is this potato heaven?